This Cat mother apparently had the idea that her children could be of help in her spring cleaning. 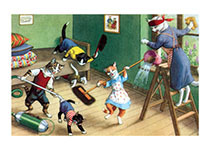 This Cat mother apparently had the idea that her children could be of help in her spring cleaning. As other mothers have discovered, children's help can be more trouble than it's worth.